Full dates for heats, semi finals and final are available here. National Stillwater Rules are available here. Stillwater Committee wish to thank all fisheries for letting us use their water. The 2017 Stillwater Final will be held at Forbes of Kingennie on 13th May 2017. The 2017 International will be held at Forbes of Kingennie on Wednesday 25th October. Further dates and venues for the additional semi finals and final for qualification for 2018 will be confirmed shortly. The final of the 2016 National Stillwater Championship will be held at New Haylie Fishery on Sunday 15th May. Full details of all the heats and entry fees can be found here. Copies of rules can be found here. Full list of qualifiers for Final of 2015 Stillwater Competition is here. Final is being held at Allandale Tarn, Polbeth West Calder on Sunday 24th May. Anglers to register and be ready for briefing and peg draw for 8.30am. SANA would like to thank all the fisheries who allowed us to hold a heat this year, to all the officials and volunteers who helped out at these heats and to all anglers who took part. The semi final draw was made by Fishery Owner Marika Ziarnik after the final heat at Glenbervie Fishery on Sunday 5th April. Anglers should be ready for briefing at 8.30am at their allotted semi final venue. The final will be held at Allandale Tarn on Sunday 24th May when the top 6 anglers will represent Scotland at the Bank International in Ireland in October. Good luck to all anglers, the draw can be viewed here. The draw for each semi final was made on Sunday 13th April immediately after the final heat at Swanswater. Anglers can check the full draw by clicking either Allandale Tarn or Kingennie Resort. There will be 12 qualifiers from each semi final to compete at the final of the 2014 Stillwater Championships on Sunday 25th May at New Haylie Fishery, Largs. The 2014 Scottish National Champion will be crowned and the Team to compete for Scotland at the Bank International on Wednesday 29th October 2014 in England will be selected, top 6 anglers and 1 named reserve. Each semi final will cost £25. Anglers are to report ready for briefing and peg draw at 8.30am at each venue. Lunch will be provided. Any competitor with any questions can contact the officials by e-mail here. The dates for the heats, semi final and final of the 2014 National Stillwater Championship are now set. 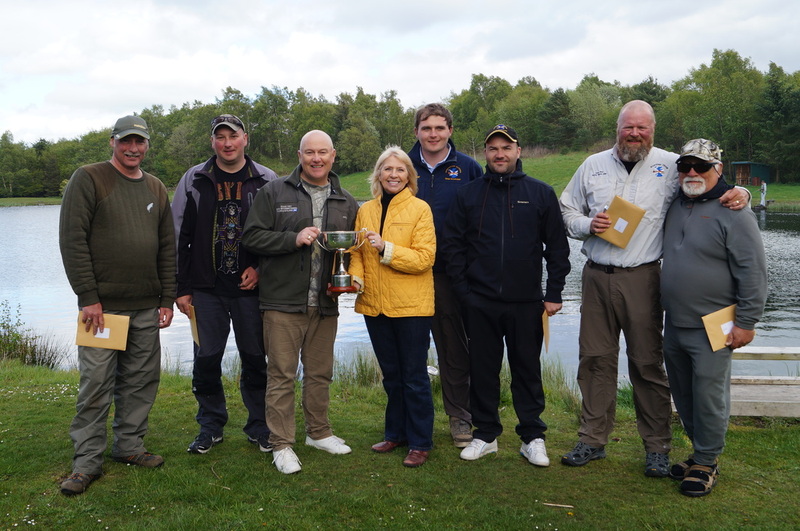 the final the top 6 anglers and 1 reserve will be selected to represent Scotland at the 2014 International event which will be hosted by England at Chatton Fishery, near Alnwick, Northumberland from 27th -30th October 2014. Haylie Fishery on Sunday 25th May. Latest results can be found here. The Stillwater Bank Championship competition is open to anglers who meet the eligibility criteria to represent Scotland at International event. Full details on criteria can be found here. 7 venues will hold heats this year and the final will be on Sunday 23rd June at Lochter Fishery. All the details are here. Anglers can enter more than once to gain a place at the final. From the final the 2013 Team of 6 anglers and 1 reserve will be selected to compete for Scotland at the Stillwater International. In response to feedback we are trying to make it easier to enter the competition this year. To book your place, please contact the relevant Fishery direct. Fees will be collected on the day. A copy of the competition rules is available here. Local rules can be set by the fishery and must be observed by all competitors. The competition will be fished on a catch and release basis. Membership of SANA is not a requirement to enter the competition but if selected to represent Scotland at the International Match anglers will need to take out Individual membership of SANA. Membership forms are available here. Brain Kerr , Ireland won the largest rainbow trophy with fish of 48cm. 218 fish caught in total by 24 anglers. Steve Cowan, Richard McHattie and reserve Jim Adie. other qualifiers were Stephen Cowan, Stephen Dallas, Ken Anderson, Grant McCauley and Jim Edwards. Halfway point of the National Championship has been reached and another 3 anglers have qualifed for the final. Today's winner was Alan Smith 7 fish and 11 points then Stuart Fraser with 6 fish for 11 points. Alan's 1st fish was earlier. There were 4 anglers tied on 9 points therefore time of first fish came into effect and final qualifier was David Bullen. On an extremely cold day it was great credit to all the anglers who all caught fish. Results from Markle are here. At half way stage there are 23 qualifiers so far. 76 anglers have taken part from first 5 heats. Full list of finalists after 5 events is here. Full results from Bangour are here. Full results from Kingennie Fishery are here. The First Heat at Allandale Tarn on 31st March is now full. The next heat will be at Kingennie Fishery, Sunday 8th April. To reserve your place please contact the SANA Office 01577 861116 or call the fishery. Contact details for all fisheries and dates for heats can be found here. Full result from Allandale Tarn Heat can be found here. Initial details have been issued by Wales for the International Stillwater Championship 2012. The event will take place from Sunday 14th October(arrival) and Thursday 18th October(departure). Venue will be Garnffrwd Fishery, Llanelli. International event. Full details on criteria can be found here. Membership of SANA is not a requirment to enter the competition but if selected to represent Scotland at the International Match anglers will need to take out Individual memebrship of SANA. Membership forms are available here. 10 venues will hold heats this year and the final will be on Sunday 8th July at Glen of Rothes Fishery. All the dates are here. selected to compete in Wales for Scotland at the Stillwater International. Applications at heats are on a first come first served basis. Entry forms are here or are available from the fishery. Your entry money must be accompanied by an entry form. The dates for the 2012 National Stillwater Championship are available here.